Today is the birthday of Howard Thurston, born 142 years ago on July 20, 1869. Thurston was Houdini's friend and most famous contemporary. He was also Vice President to Houdini at The Society of American Magicians. Magicos still love to debate who was the more popular "magician" of the day -- the key word there being "magician." I won't get into that here, I will just say HARRY BIRTHDAY HOWARD and direct you over to the website of the man who is truly Wild About Thurston, Rory Feldman (who I thank for reminding me of today's significance). 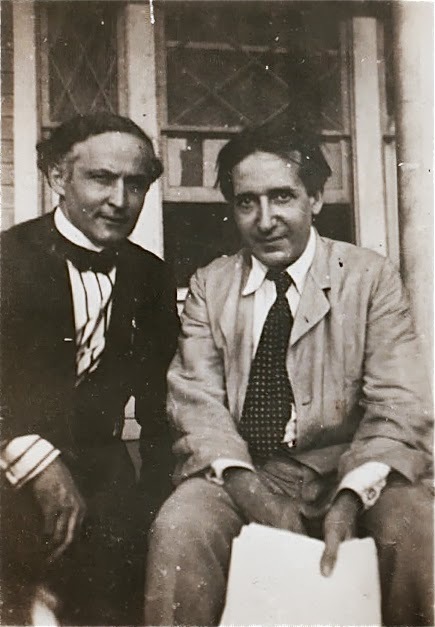 Photo of Houdini and Howard Thurston from the New York Public Library's Billy Rose Theatre Collection. Nice photo, John! Never seen it before. It is a great shot. I've seen (and posted) one where HH is looking at Thurston, but this one is less common.